Is Giving Chanukah Presents a Non-Jewish Custom? I am having a very hard time, as the holidays approach, with teaching my children the beauty of Chanukah and not having them see it as a Jewish X‑mas. This is especially difficult when all of their non-Jewish friends will be receiving endless gifts, and they expect that as well. I know it has become somewhat of a tradition to give children gifts during Chanukah, but is this really a Jewish custom? I don’t want this Jewish holiday to be reduced to great presents. Any advice? I am so glad you wrote, as you raised a very important question that many of us can relate to. You ask a very straightforward question: is gift-giving on Chanukah a Jewish custom? The answer, however, is a little less direct. There are no biblical or Talmudic roots to the concept of gift-giving on Chanukah of any kind. There is, however, an age-old custom to give gifts of gelt (money) to children on Chanukah, so that we can teach them to give some of it to charity—and just to keep things festive and happy. Some, in fact, have the custom of gelt-giving each weeknight of Chanukah. The education of children is the foundation of what we celebrate on ChanukahThe concept of gift- or incentive-giving is prevalent throughout Jewish tradition, and does have a link to Chanukah. In order to make that link, we need to understand the meaning of why we celebrate on Chanukah. The Greeks, unlike the Persians in the story of Purim, were not out to annihilate the Jewish people through the destruction of our bodies. The Greeks were after our souls. Their aim was to elevate the importance of physical matter over spirit, and to defile our belief in one G‑d. They wanted us to banish the concept of the divine, abolish Torah study and adopt their Hellenistic perspective. So the battle we fought in the story of Chanukah was not just physical, it was also very spiritual. In order to defy the Greeks and emerge victorious, we needed to re-educate ourselves and strengthen our resolve in the learning of Torah and performance of G‑d’s commandments. The word chanukah shares a root with the word l’chanech or chinuch, which means “to mold” or “to educate.” Education, especially the education of children, is the foundation of what we celebrate on Chanukah. Maimonides writes that a child needs to be provided with an incentive to learn Torah. He suggests that a child be given “walnuts, figs and honey” to sweeten his learning. And here is the connection with the concept of giving Chanukah gifts or gelt (money in Yiddish). The idea of giving money is also an opportunity to teach the child about the concept of giving charity and helping those less fortunate than yourself. Educating a child is a huge responsibility. And while providing incentives for good behavior and growth in Jewish learning is encouraged, we have to be careful that the gift or incentive provided doesn’t overshadow the deed. The same idea applies with giving gifts on Chanukah. 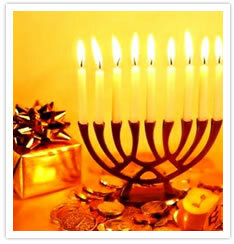 It is a very Jewish concept to increase in joy and celebration during festive holidays. We emphasize our joy by sharing Chanukah meals with friends and family, by decorating our homes with the menorah lights, and by celebrating with songs and gifts. We also emphasize our joy by sharing the story of Chanukah and deepening our understanding of it and its meaning in our lives. That is the essence of Chanukah. The latkes (potato pancakes) and dreidels (spinning tops) and gifts are fun, but they are extras. It is possible, however, to highlight the meaning of Chanukah through gift-giving. For example, giving your kids books or tapes or videos about the story of Chanukah, so they understand what it is we’re celebrating. Or, by drawing attention to the concept of the triumph of light over darkness—another powerful theme of the Chanukah story—you could invite your kids to bring “light” where it is dark. You could, for example, make a project and bring it to a retirement home and brighten up someone’s day, or hand out cookies or latkes or winter coats to homeless people, or teach another Jew about our Chanukah traditions and invite them in to make a blessing over the candles with you. It is possible, however, to highlight the meaning of Chanukah through gift-givingSince we increase in light each day of Chanukah, we can teach our children to increase in their work of spreading light as well, and each day of Chanukah to do some act of giving. There is no limit to the creativity factor here, and I’m sure your kids can offer some wonderful ideas as well. The bottom line is: if we expect our children to really get into the spirit and meaning of Chanukah, we have to provide them with that venue. Now is the time to brush up on your knowledge of Chanukah and explore some of its deeper teachings (click here for the Chanukah site, which is a phenomenal resource). It’s okay to give gifts on Chanukah, as long as they are given with the purpose of drawing a child close to his or her roots, and that the act of giving speaks louder than the gift itself. “Dear Rachel” is a biweekly column that is answered by a rotating group of experts. This question was answered by Sarah Zadok. Sarah Zadok is a childbirth educator, doula and freelance writer. She lives in Ramat Beit Shemesh, Israel, with her husband and four children. As a child, I came to see Hanukkah as an ersatz Xmas, and disliked it on that account, especially when I noticed that it has no real relation to the Hebrew calendar, but falls, ineptly, on the 25 of the Hebrew month, as if in imitation of the pre-Christian solstice festival. Nonetheless we gave our little boy eight gifts (one for each night), two of which came from his grandparents, and I served latkes or other fritters every night, throughout his childhood. Now he gives HIS little boys Hanukkah gifts, and I conform to his practice. HOWEVER, the main Jewish holiday season is autumnal. When our baby came, I began to build and decorate a sukkah, and HE now builds and decorates a sukkah. THAT is the Jewish time to REALLY celebrate, & it is FUN! And the Sukkah reminds us that our true home is GD, not mere bricks or stones. My grandparents, may they rest in peace, fled Eurpoe just a step ahead of the Nazis. My cousins, siblings, and I have wonderful memories (and photos!) of Chanukah at their home, as they had a family party each year on the Sunday night of Chanukah. Happy Chanuka Great question and response. I learned some great truths about Chanuka that I never knew about which still isn’t too much. Growing up in a secular modern community and family, most Jewish and Christian children probably received the same amount and quality of gifts. Ironic how a victory to celebrate and continue the Jewish emphasis on the spirit vs. the Greek Hellenistic physical emphasis has evolved in much of modern society to a largely physical celebration among many Jews. American Diaspora Stigma It's hard to not cringe at the questions that arise this time of year for our children. As a Jew who grew up in the States we were taught to tell non Jews that Chanukah was not a major holiday, that it was militaristic in nature and not one of our big days. It was an apparent attempt to distance ourselves from the nation's other winter holiday (the one with trees and gifts). But it damages our heritage when we say this is a minor celebration. Even when our traditions have seemingly similar actions like gift giving we don't have to overcompensate by belittling ourselves. As an adult living in Israel, this is not a problem. We can celebrate with gifts and gelt and family traditions that we played down in my childhood. We try to avoid spending too much on gifts but Chanukah in our house means handmade gifts and lots celebration of the miracle and our many blessings B'Eretz HaKodesh, in the holy land. No gifts family My husband and I were raised in different countries (Mexico and Venezuela) both with strong Jewish communities. We were also both raised with in the conservative Judaism and neither him or I ever go gifts during Hanukah. Taking into account that our countries are 99% catholic, for our parents giving in to gifts giving would have been very easy. But, it was never an issue. depends on the situation For those who live in a big urban area where there are many Jewish families/ observant relatives and lots of events, it makes sense to downplay gift giving of Chanukah. That being said, if the family lives in a dwindling Jewish community where the children have minimal contact with other Jewish children and have zero extended family with kids, ramping up Chanukah works well. I grew up in such a community, and my kids are in such a community now. Having a beautifully decorated home (with Hannukah items and blue and silver colors) and lots of great gifts makes it a great occasion and makes my kids feel much less left out. However - and this is important - we couple this with shul attendance, a tiny family Hannukah dinner and having a special event for an elderly, isolated Jewish person. One night of Hannukah, part of the kids' gifts will be some money - to donate to their favorite cause . chanukah gift giving or NOT we are converting, my husband myself and 6 children. The eldest is 25 the youngest is 4, and one of the most special things has happened. As parents we expected to have a full scale riot, a war, when we deleted the unecessary gift giving related to the end of the year. BUT no, our wonderful children have each accepted and in fact thrill with the observance of chanukah, the latkes, the doughnuts the lighting of the menorrah.